The IATF 16949:2016 Audit Guide and Checklist provides all the information necessary for an in-depth assessment of your ISO 9001:2015 / IATF 16949:2016 Quality Management System. It was written to help auditors conduct a process based audit and stresses process effectiveness as well as compliance. The evidence-based questions start with top management and flow through the path of a generic product within an organization. Following the 16 insightful chapters on such topics as process design, process auditing, PDCA, Turtle Diagrams, Context of the Organization and Systems Integration you can dive into the evidence-based questions. The first part of the audit examines the complete system. This includes questions about the conformity of the system to the standard along with dozens of Best Practice questions to help you better evaluate the effectiveness of the system. Questions in the second part focus on the effectiveness of the processes that are found in almost any organization, regardless of industry or sector. This Guide covers every requirement in both ISO 9001 and IATF plus Customer Specific Requirements (GM, FORD, FCA, VW, PSA), Core Tools (APQP (2018), FMEA (2018), Control Plans, MSA, Process Capability, and PPAP) and CQI requirements (8, 9,11, 12, 14, 15, 17, 19, 23, 24). The Guide includes: 584 Assessment questions, 188 questions related directly to Customer Specific Requirements, 71 Core Tools Questions and 15 Specific CQI Questions and 150 valuable notes designed to help auditors understand the intent of specific questions. A blend of insightful guidance and practical evidence-based questions that help take your QMS to the next level. Additional clarity on Context of the Organization, Safety Related Products, MAQMSR, Sanctioned Interpretations and FAQs. Once payment is confirmed you will immediately be able to download your copy. If you have any questions about the purchase process please take a look at our FAQ page or contact us directly. We will not sell your email address and we do not spam. We offer free downloads of all future editions of this 2016 Guide and we will use the email address you provide to notify you when these are available. If you would prefer a printed paperback copy we sell those here on Amazon. If you’re interested in taking a look inside, there is a compilation of excerpts from all of our ebooks included in our Free Audit Resources which you can download immediately with only an email address. 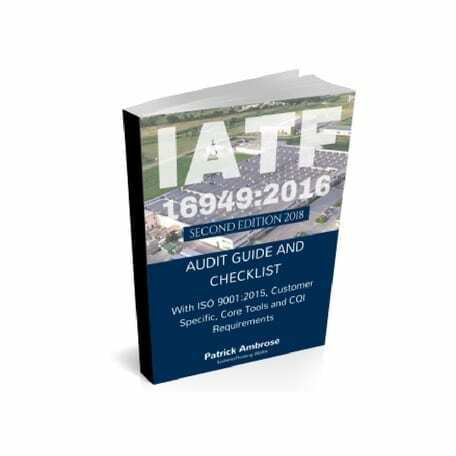 One of the best resources for IATF 16949 & ISO 9001. The questions are well thought out and the side notes are insightful. It really is worth the money as you get 3 other books for the price.